Roaming Stamper: Under the Stars again! Ok, this is my last group of cards for this set! I have to admit I've really had fun playing with it, but it's time for it to be put away at least for a little while! 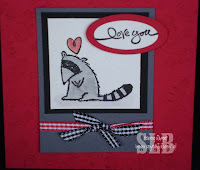 First card uses the cute little racoon. He seemed very lonely sitting in the box while the bear and mosquito were having fun. So, I made this quick little card with him. This card measures 4x4. All products from Stampin' Up! 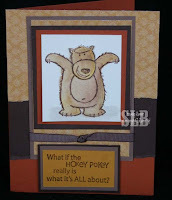 Next card I'm back to the bear, and I think it's a funny one! He just looks like he's doing a little dance so this quote just seemed to fit. Paper: Real Rust, Chocolate Chip, Close to Cocoa, More Mustard, Juntos DSP (from the Spanish Language Catalog), Watercolor paper. I thought the DSP resembled honeycombs! I hope you've enjoyed my Under the Stars cards. I had a lot of fun making them. This set is on sale until September 30th if you decide you just have to have it! I am lovin' this bear!! He's almost as cute as the sock monkey! Great card!